Let's face it, people, tomorrow and next week many offices, or in my case schools, will be hosting ugly Christmas sweater parties. I'm not sure exactly when this became a trend or how it started, but it really has become quite a phenomenon during the holiday season. I don't own any ugly Christmas sweaters, but I do own my fair share of offbeat, quirky or, to use a word that has a more positive connotation, "whimsical" sweaters. One of my favorites in my collection is this one featuring a lady clad in a big puffy coat and matching fuzzy hat. She even has green stockings or boots to match the buttons on her coat. Unfortunately this sweater is no longer available from J. Crew, but another designer, Alice + Olivia has a similar asthetic with their "Stace Face" or Stacey designs. The character has some big, over-sized sunglasses that are pretty much just like mine, which I adore. In fact, I adored the image so much that I just bought my first Alice + Olivia piece a few weeks ago and now I am smitten with the brand. Below you will see some of my picks from their current collection featuring many of their iconic Stacey designs. I adore all the colors in this outfit together and your outfit is really adorable! I just bought some similar pants, so this is great inspiration for me! Thank you Mary! I would love to see how you style your pants. I love this particular pair because the pattern is so bold and fun! Thanks Kim! I actually just kind of came up with this outfit in a very groggy state in the morning! I think sometimes that's when I do my best work! Have a great weekend! I found you through the Fab Favorites Link Up and could not be more delighted. First, I LOVE this outfit, every single piece of it and all of it combined. Second, I am an alice + olivia junkie, and those pumps are even on my board. I love your taste! Thank you so much Regina! Alice + Olivia is seriously becoming one of my favorite brands. In doing this post I found so many of her pieces that are now on my wishlist. Katie, would you put in the post the links to the other ways you've styled the jumper please? I'd love to see how you've worn it other ways as it's a fantastic piece of knitwear. I can quite imagine people stopping you and asking about it! Is she Svetlana or Solange??? Wonderful styling. Especially that pink coat - swoon! 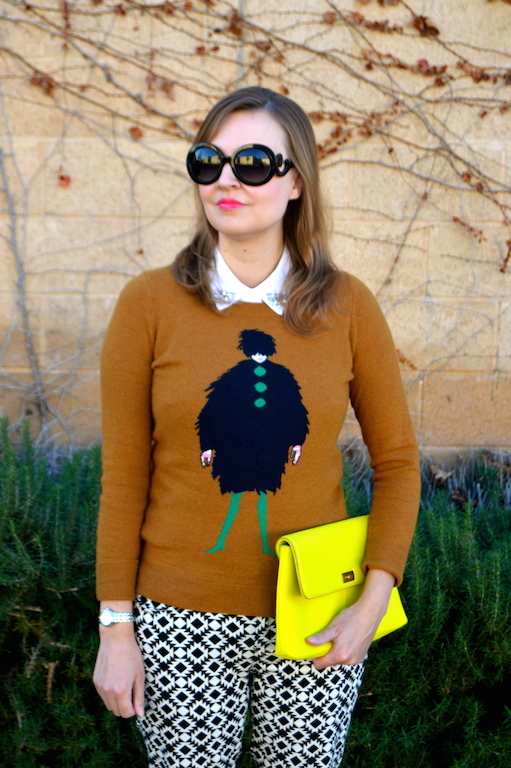 I just updated my post so that in the second paragraph there are links to the other ways I've styled the jumper. I didn't realize I had posted it so many times on my blog until I went back to look for it. Have a nice weekend! 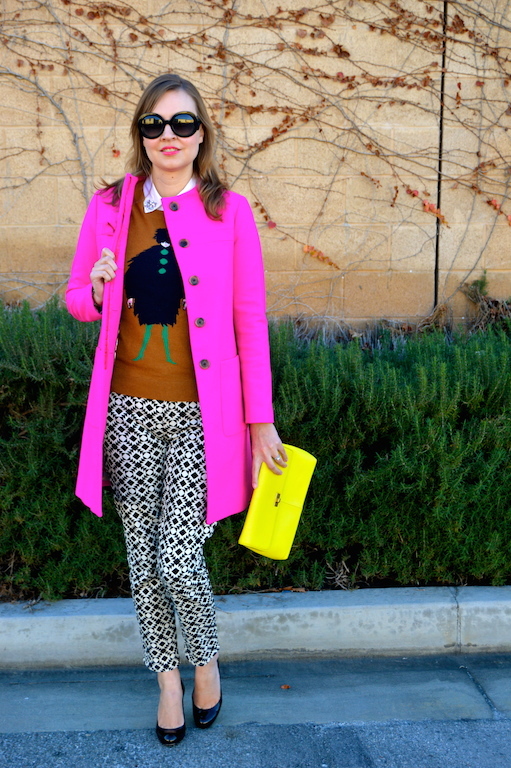 What a fun sweater and I love your colorful styling! You do color so well, Dear! Thanks so much for being a part of Fun Fashion Friday! Thank you! As you know, I love color! Thanks so much for hosting this week! That is definitely a fun top! :) Perfect as you aren't limited to wearing it just for themed Christmas parties! Yes, you can truly wear it all winter with so many things, but it also works for Christmas. It's very versatile! Love this!! I love how colorful you are!! Awesome! I love everything about this outfit - the sweater is fabulous, and the bright colours of your coat and bag are just amazing! Oh my I ADORE this whole outfit -- from the mix of prints and patterns to the bright colors. I'm so sad that jacket is no longer for sale at J.Crew. I need it in my life! I missed out on this cute sweater and love how it pairs so well with those ptas! Thank you for being a part of TBT Fashion link up and hope you had a wonderful Christmas. See you in 2016!